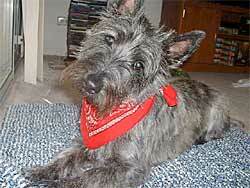 Favorite food: Flint River Ranch (Kibble & Drywater), beef and rice, and treats of course. Favorite toy: Raquet balls, nylabones, and anything that squeaks. Favorite activity: My job is to sit by the patio door and watch over my yard (you can never be too careful with those pesky squirrels around!). When I'm not working, I enjoy going to the dog park, taking long walks with my Mom, and playing with my toys. Special talents: Everyone who meets me thinks I'm very smart. I know how to do all the normal tricks, plus I know how to wave hello when I'm "sitting pretty". All I do is move my paw and the crazy humans think I'm a genius! Most embarrassing moment: I'm a big, strong, boy terrier... I don't get embarrassed. Most trouble I ever got into: I am a perfect angel. (My Mom's not going to see this, right?). My favorite friends: My bestest friends are 3 Westies. They belong to my Mommy's fiance's parents. Their names are Snowey (she's 12 and always grouchy! ), Bailey (he's 2), and Abbey (she's 1, and she's my favorite!). Biggest adventure: I have a LOT of great adventures, so it's hard to pick just one.